It leverages Improbable’s SpatialOS platform. From a distance, Seed looks like any other settlement-building game. 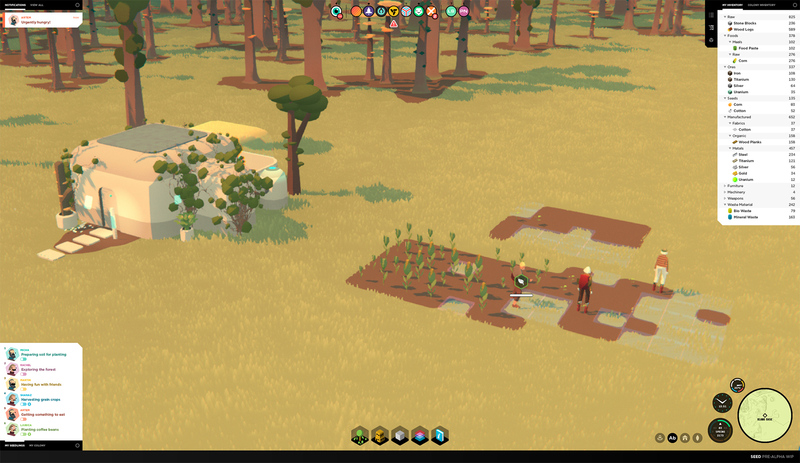 Tiny villagers shuffle around a colorful, low-poly map, collecting wood, wheat and other important resources. At any time, you can zoom in, check the stats of individual people and cash in items for houses and other important structures. Crucially, though, you're not alone. The game takes place on a single planet that will, eventually, be inhabited by hundreds, possibly thousands of players simultaneously. Everyone will have their own towns and the freedom to choose who they collaborate and compete with. It will also be a shared, online-only experience that runs 24 hours per day, simulating the actions of your villagers whenever you decide to close the application. Players will control their citizens indirectly. You can build houses, which spawn new villagers, and check each person's daily schedule. In the future, you'll be able to tweak this itinerary and also plan their actions for the days, weeks and months ahead. Then, it's a matter of observing the simulation, reacting to the needs of your people, and choosing the best way to coexist with other players who encounter your settlement. It's an ambitious project made possible by SpatialOS, a much-hyped platform built by the secretive startup Improbable. The service uses multiple servers, working in tandem, to help developers create large, persistent worlds and simulations. It's already being used in a vast, massively multiplayer online RPG called Worlds Adrift, developed by British team Bossa Studios. Seed is part of a second wave, including the battle royale-inspired Mavericks: Proving Grounds, that hopes to leverage the technology for fresh and potentially groundbreaking gameplay. At Gamescom 2018, I played an early version of Seed with Mundi Vondi, CEO and co-founder of developer Klang Games. We created a couple of characters each and formed a new settlement, called 'Nickland' (I was tired and lacking imagination, okay?) in an open, grassy area of the map. Immediately, our villagers, decked in simplistic robes and glasses, started to roam and collect precious resources for the group. At any time, I could click on their faces' in the top right-hand corner of the screen and review their Sim-like needs, including sleep, hunger, love and entertainment. Once enough resources had rolled in, I created some simple tents around a small campfire. A few minutes later, I had a couple of houses and four villagers at my disposal. It was a peaceful and relaxing experience that encouraged me to take breaks and simply watch the simulation unfold. In the future, though, many players will be competing for power and influence across the world. You can find a quiet corner and strike out on your own, hoping that others will leave you be, or join an already impressive settlement that can provide resources and security. 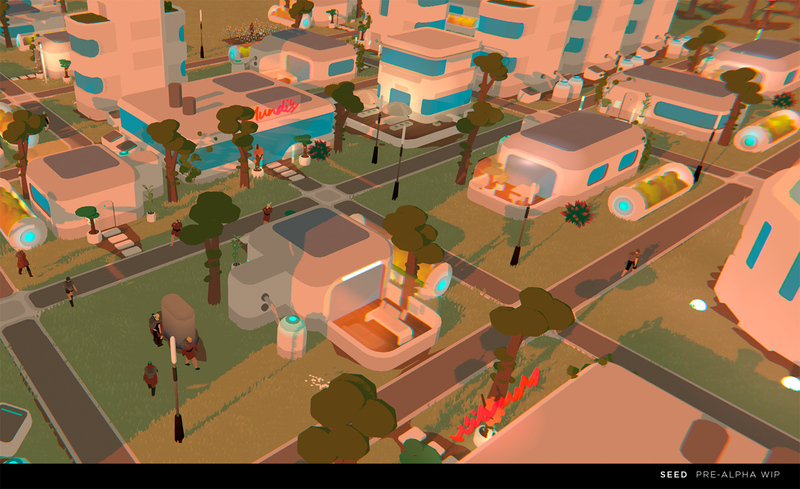 Players that choose to group up will need to form some kind of government for their own decision-making and that of their virtual citizens. It's a complex idea that, if successful, could match the political and economic pull of games like Eve: Online. 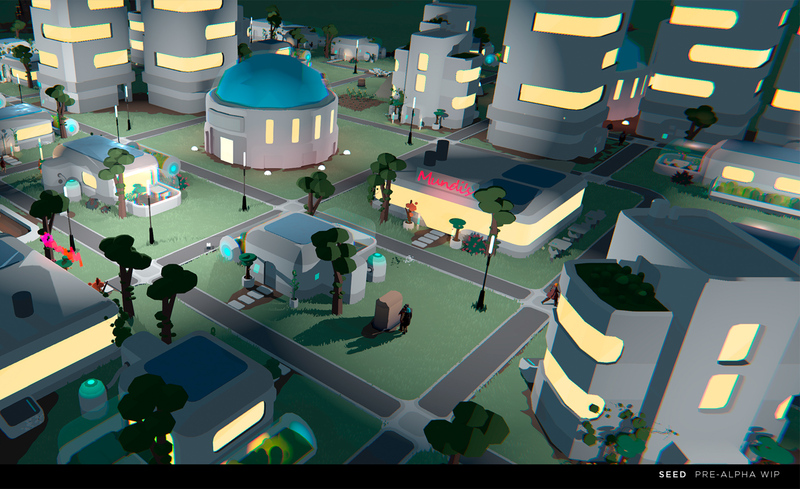 To perfect the system, Klang Games is collaborating with Lawrence Lessig, an activist and Harvard Law School professor who ran for the Democratic Party's nomination in the 2016 US election. "We hope people come up with some crazy government systems that don't follow the pace and conventions of real life," Vondi told me. Seed is still early in development. Klang wants to build a hunting system, for instance, that would introduce nasty infections, life-threatening surgery and other tricky health mechanics. The final version will also let you zoom inside buildings and assign villagers useful jobs. These additions, and the challenges associated with SpatialOS, mean the game is "at least three years away" from release, according to Vondi. That's an awfully long time, however the team in Berlin has been thinking about this game for 10 years, and working with Improbable for three. It doesn't seem to be in much of a rush. "There's a long way to go," Vondi chuckled. Follow all the latest news live from Gamescom here! Nick Summers is a senior reporter, editor and photographer at Engadget. He studied multimedia journalism at Bournemouth University and holds an NCTJ certificate. Nick previously worked at The Next Web and FE Week, an education-focused newspaper in the UK. He lives on the south coast of England with a stack of half-finished Gunpla. Even search results need to be perfectly balanced. And Sony's smartphones still aren't working out.